3 Bedroom End of Terrace Cottage For Sale in Burnley for Offers Over £189,950. A wonderfully unique opportunity not to be a missed, a viewing is essential to appreciate! This stone built end cottage style home is beautifully presented and maintained throughout offering deceptively spacious accommodation. Comprising entrance lobby, lounge, spacious living room open to the lovely kitchen and conservatory overlooking the garden to the ground floor. There are two useful basement rooms, one used as a work shop and the other as a laundry room. There are three well proportioned bedrooms, second bedroom with en suite shower room and a fantastic modern family bathroom. The property provides driveway parking to the side and a delightful enclosed rear garden offering rural views. Entrance is gained at the front of the property via a uPVC door into the lobby providing access into the lounge. Double glazed uPVC window facing the front. Radiator and modern electric fire set on the chimney breast, ceiling light. Double glazed uPVC window with leaded glass facing the side providing open views. Radiator and electric stove style fire set within the chimney breast, laminate flooring, ceiling light. 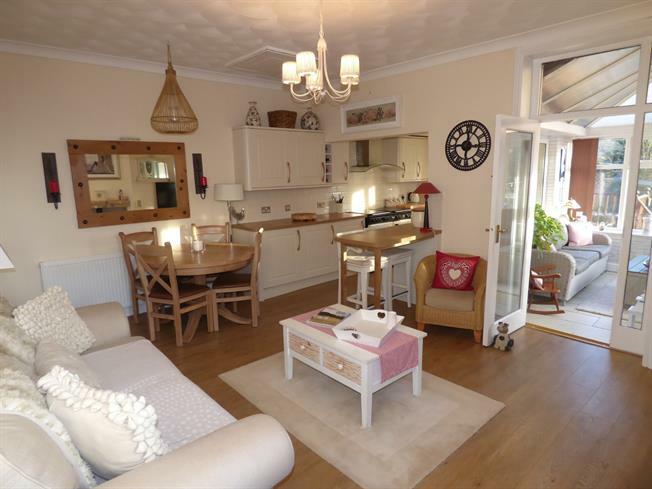 Open to the kitchen, access to the basement and glazed door leading into the conservatory. French uPVC double glazed doors opening onto decking. Double glazed uPVC window facing the side providing open views. Laminate flooring, spotlights. Roll edge work surface, fitted wall and base units, breakfast bar, single sink with mixer tap and drainer, space multi fuel range oven, stainless steel extractor, integrated slim line dishwasher, integrated washing machine, fridge and freezer. Remote control wired in radio and ceiling speakers. Double glazed uPVC windows facing the rear and side offering delightful rural views. Tiled flooring, feature exposed stone, ceiling light. French uPVC double glazed doors leading out to the garden. Radiator, ceiling light. Roll edge work surface, fitted base units, space for dryer, fridge and freezer. Double glazed uPVC window with leaded glass facing the side. Radiator, feature beam ceiling, ceiling light. Access to the bedrooms, bathroom and en suite. Loft hatch with pull down ladder, the loft is boarded for storage and has electric lighting. Double aspect double glazed uPVC windows facing the front and side. Radiators, ceiling lights and a lovely dressing area. Double glazed uPVC window facing the rear overlooking fields. Radiator, laminate flooring, ceiling light. Access to the en suite. Heated towel rail, tiled flooring, tiled walls, spotlights. Low level WC, double enclosure cubicle and thermostatic shower, pedestal sink, extractor fan. Providing access to bedroom two. Double glazed uPVC window facing the rear overlooking fields. Radiator, laminate flooring, ceiling light. Heated towel rail, laminate flooring with feature spot lighting, part tiled walls, spotlights. Low level WC, panelled bath with mixer tap, thermostatic shower over and glazed screen, pedestal sink, extractor fan. To the rear a delightful enclosed garden area with feature wrought iron gate leading to the private driveway parking to the side. The garden has a raised decked area, gravelled for low maintenance, feature pergola, outside tap and wall surround. The garden is south facing and offers open rural views.